For most of the surfaces used in daily life, the friction coefficient is less than 1. Is it always necessary that the friction coefficient is less than 1? It is not necessary that the friction coefficient is always less than 1. When the friction is stronger than the normal reaction force, the coefficient of friction is greater than 1. For example, silicon rubber has the coefficient of friction greater than 1. Why is it easier to push a heavy block from behind than to press it on the top and push? It is easier to push a heavy block from behind than from the top because when we try to push a heavy block from the top, we increase the normal reaction force, which, in turn, increases the friction between the object and the ground (see the figure). What is the average friction force when a person has a usual 1 km walk? The person started with zero initial velocity, covered a 1 km distance and ended with zero velocity, so the acceleration is zero. Hence, the average friction force is zero. Why is it difficult to walk on solid ice? It is difficult to walk on solid ice because the coefficient of friction between our foot and ice is very less; hence, a person trying to walk on solid ice may slip. Can you accelerate a car on a frictionless horizontal road by putting more petrol in the engine? Can you stop a car going on a frictionless horizontal road by applying brakes? No, we cannot accelerate or stop a car on a frictionless horizontal road. The car will not move on a frictionless surface because rolling is not possible without friction. Spring fitted doors close by themselves when released. You want to keep the door open for a long time, say for an hour. If you put a half kg stone in front of the open door, it does not help. The stone slides with the door and the door gets closed. However, if you sandwitch a 20 g piece of wood in the small gap between the door and the floor, the door stays open. Explain why a much lighter piece of wood is able to keep the door open while the heavy stone fails. In the first case, the normal reaction force is equal to the weight of the stone, hence the stone slides easily because the friction force is very less. However, in the second case, a small piece of wood is sandwiched, which increases the normal reaction force on the wood due to the weight of the door. Hence, greater the normal reaction force on the wood, the greater will be the frictional force between wood and the floor. A classroom demonstration of Newton’s first law is as follows : A glass is covered with a plastic card and a coin is placed on the card. The card is given a quick strike and the coin falls in the glass. (a) Should the friction coefficient between the card and the coin be small or large? (b) Should the coin be light or heavy? (c) Why does the experiment fail if the card is gently pushed? (a) The coefficient of friction between the card and the coin should be small. (b) The coin should be heavy. (c) If the card is pushed gently, the experiment fails because the frictional force gets more to time to act and it may gain some velocity and move with the card. Can a tug of war be ever won on a frictionless surface? No, a tug of war cannot be won on a frictionless surface because the tension in the rope on both the sides of both the teams will be same. So, to win, one of the teams must apply some greater force, which is the force of friction. Why do tyres have a better grip of the road while going on a level road than while going on an incline? 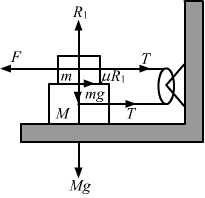 The normal reaction force on a level road is mg, whereas on an inclined plane it is mg cos θ, which means that on an incline road the friction force between the tyre and the road is less. Hence, tyres have less grip on an incline plane and better grip on a level road. You are standing with your bag in your hands, on the ice in the middle of a pond. The ice is so slippery that it can offer no friction. How can you come out of the ice? By throwing the bag in one direction, we gain some velocity in the opposite direction as per the law of conservation of linear momentum. In this way we can come out of the ice easily. When two surfaces are polished, the friction coefficient between them decreases. But the friction coefficient increases and becomes very large if the surfaces are made highly smooth. Explain. The coefficient of friction increases between two highly smooth surfaces because the atoms of both the materials come very closer to each and the number of bonds between them increase. (d) may increase or decrease. If we decrease the angle between this contact force and the vertical, then Fcosθ increases and the normal reaction force (N) as well as the frictional force (f) decrease. When we take smaller steps on ice, the normal reaction force exerted by the ice is small. Therefore, the smaller steps ensure smaller friction. 1+μ2Let T be the force applied on an object of mass M.
If T = 0, Fmin = Mg. If T is acting in the horizontal direction, then the body is not moving. (d) > 500 N for time âˆ†t1 and âˆ†t3 and 500 N for âˆ†t2. d) >500 N for time âˆ†t1 and âˆ†t3 and 500 N for âˆ†t2. During the time interval âˆ†t2, the scooter is moving with a constant velocity, which implies that the force exerted by the seat on the man is 500 N (for balancing the weight of the man). During the time interval âˆ†t1 and âˆ†t3, the scooter is moving with constant acceleration and deceleration, which implies that a frictional force is also applied. Therefore, the net force exerted by the seat on the man should be >500 N.
(d) the system cannot remain in equilibrium. Since the wall is smooth and the surface of A and B in contact are rough, the net vertical force on the system is in the downward direction. Hence, the system cannot remain in equilibrium. (d) depends on the masses of A and B. The normal reaction force on the system (comprising of wall and contact surface of A and B) is provided by F. As can be seen from the figure, the weight of A and B is in the downward direction. Therefore, the frictional force fA and fBA (friction on B due to A) is in upward direction. (d) depends on the volume of the car. Given: both the cars have same initial speed. Let the masses of the two cars be m1 and m2. s=ut+12at2Thus, we can say that both the cars have same minimum stopping distance. (d) shut the engine off and not apply brakes. When we apply hard brakes just enough to prevent slipping on wheels, it provides optimum normal reaction force, which gives the maximum friction force between tyres of the car and the road. A block A kept on an inclined surface just begins to slide if the inclination is 30°. The block is replaced by another block B and it is found that it just begins to slide if the inclination is 40°. (d) all of three are possible. and the coefficient of friction depends on the angle of inclination (θ) and does not depend on mass. From the above equation it is clear that acceleration does not depend on the mass but depends on θ and μ. A boy of mass M is applying a horizontal force to slide a box of mass M‘ on a rough horizontal surface. The coefficient of friction between the shoes of the boy and the floor is μ and that between the box and the floor is μ’. In which of the following cases it is certainly not possible to slide the box? Let T be the force applied by the boy on the block. Let F, FN and f denote the magnitudes of the contact force, normal force and the friction exerted by one surface on the other kept in contact. If none of these is zero. (d) FN − f < F < FN + f.
The system is in equilibrium condition when F = f.
Hence, the net horizontal force is zero. Therefore, we can say that F > f. So the net horizontal force is nonzero. F > f, and so the net horizontal force is zero. F > f and f = μFN will not be satisfied So it cannot be said that the net horizontal force is zero or nonzero. fμ-f<F<fμ+ff1-μμ<F<f1+μμFor the above relation, we can say that F ≠ f and so the net horizontal force is nonzero. (d) the bodies may be rough but they don’t slip on each other. The contact force exerted by a body A on another body B is equal to the normal force between the bodies. Therefore, we can conclude that the force of friction between the bodies is zero or the bodies may be rough but they don’t slip on each other. Mark the correct statements about the friction between two bodies. (a) Static friction is always greater than the kinetic friction. (b) Coefficient of static friction is always greater than the coefficient of kinetic friction. (c) Limiting friction is always greater than the kinetic friction. (d) Limiting friction is never less than static friction. (d) Limiting friction is never less than the static friction. All the above statements are correct. The static friction is sometimes less than the kinetic friction. A block is placed on a rough floor and a horizontal force F is applied on it. The force of friction f by the floor on the block is measured for different values of F and a graph is plotted between them. (a) The graph is a straight line of slope 45°. (b) The graph is a straight line parallel to the F-axis. (c) The graph is a straight line of slope 45° for small F and a straight line parallel to the F-axis for large F.
(d) There is a small kink on the graph. When force F is applied on the block, the force of friction f comes into play. As we increase the applied F, the static friction force adjusts itself to become (equal) to the applied force F and goes upto its maximum value equal to limiting friction force.After this ,it is treated as a constant force (i.e . now its value does not change until and unless the body starts moving). If the applied force F is greater than the limiting friction force, then the kinetic friction force comes into play at that time. The kinetic friction force is always less than the limiting friction force. (d) must be towards west. When the vehicle is accelerating, the force is applied (by the tyre on the road) in west direction .That causes a net resultant frictional force acting in east direction. Due to this force of friction only ,the car is moving in east direction. When the vehicle is moving with a uniform velocity, the force of friction on the wheels of the vehicle by the road is zero. A body slipping on a rough horizontal plane moves with a deceleration of 4.0 m/s2. What is the coefficient of kinetic friction between the block and the plane? Let m be the mass of the body. ⇒μk=4g=410=0.4Hence, the coefficient of the kinetic friction between the block and the plane is 0.4. A block is projected along a rough horizontal road with a speed of 10 m/s. If the coefficient of kinetic friction is 0.10, how far will it travel before coming to rest? Friction force acting on the block will decelerate it. Let the deceleration be ‘a‘. =0-1022 -1 =1002=50 mTherefore, the block will travel 50 m before coming to rest. A block of mass m is kept on a horizontal table. If the static friction coefficient is μ, find the frictional force acting on the block. So, friction force is equal to the applied force. One of the case is that the friction force is equals to zero when the applied force is equal to zero. A block slides down an inclined surface of inclination 30° with the horizontal. Starting from rest it covers 8 m in the first two seconds. Find the coefficient of kinetic friction between the two. For the block, u = 0 m/s, s = 8 m and t = 2 s.
⇒μk×1032=10×12-4⇒53μk=1⇒μk=153=0.11Therefore, the coefficient of kinetic friction between the block and the surface is 0.11. Suppose the block of the previous problem is pushed down the incline with a force of 4 N. How far will the block move in the first two seconds after starting from rest? The mass of the block is 4 kg. For the block, u = 0, t = 2 s and a = 5 m/s2. =0+125×22=10 mTherefore, the block will move 10 m.
A body of mass 2 kg is lying on a rough inclined plane of inclination 30°. Find the magnitude of the force parallel to the incline needed to make the block move (a) up the incline (b) down the incline. Coefficient of static friction = 0.2. (a) To make the block move up the incline, the applied force should be equal and opposite to the net force acting down the incline. With this minimum force, the body moves up the incline with a constant velocity as the net force on it is zero. =2×9.8×12-3.99=6.41 NBecause F = 6.41 N, the body will move down the incline with acceleration, hence the force required is zero. Repeat part (a) of problem 6 if the push is applied horizontally and not parallel to the incline. ⇒F=mg sin θ+μ mg cos θμ sin θ-cos θ (θ=30°) =2×10×12+0.2×2×10×320.2×12-32 =13.4640.76=17.7 N=17.5 NTherefore, while pushing the block to move up on the incline, the required force is 17.5 N.
In a children-park an inclined plane is constructed with an angle of incline 45° in the middle part (figure 6−E1). Find the acceleration of boy sliding on it if the friction coefficient between the cloth of the boy and the incline is 0.6 and g = 19 m/s2. Let m be the mass of the boy. A body starts slipping down an incline and moves half metre in half second. How long will it take to move the next half metre? Let a be the acceleration of the body sliding down. a=mg(sinθ-μ cosθ)m=g(sinθ-μ cosθ)For the first half metre, u = 0, s = 0.5 m and t = 0.5 s.
0.5=0+12a0.52⇒a=4 m/s2For the next half metre, u = 2 m/s, a = 4 m/s2 and s = 0.5. ⇒t=-4±16+162×4 =1.6568=0.2027Therefore, the time taken to cover the next half metre is 0.21 s.
The angle between the resultant contact force and the normal force exerted by a body on the other is called the angle of friction. Show that, if λ be the angle of friction and μ the coefficient of static friction λ ≤ tan−1 μ.
F be the frictional force. When F = μR, F is the limiting friction (maximum friction). 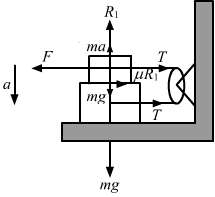 When applied force increases and the body still remains still static then the force of friction increases up to its maximum value equal to limiting friction (μR). Consider the situation shown in figure (6−E2). Calculate (a) the acceleration of the 1.0 kg blocks, (b) the tension in the string connecting the 1.0 kg blocks and (c) the tension in the string attached to 0.50 kg. If the tension in the string in figure (6−E3) is 16 N and the acceleration of each block is 0.5 m/s2, find the friction coefficients at the two contact with the blocks. μ1 = 0.75 and μ2 = 0.06. 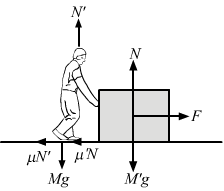 The friction co-efficient between the table and the block shown in figure (6−E4) is 0.2. Find the tensions in the two strings. Consider that a 15 kg object is moving downward with an acceleration a.
T = 5 × 10 + 10 × 3.6 + 0.2 × 5 × 10 = 96 N in the left string. = 68 N in the right string. The friction coefficient between a road and the type of a vehicle is 4/3. Find the maximum incline the road may have so that once had brakes are applied and the wheel starts skidding, the vehicle going down at a speed of 36 km/hr is stopped within 5 m.
⇒sin θ=18+182-425 -72×25 =-18+3250=1450=0.28 Taking positve sign only⇒θ=sin-1 0.28=16°Therefore, the maximum incline of the road, θ = 16°. The friction coefficient between an athelete’s shoes and the ground is 0.90. Suppose a superman wears these shoes and races for 50 m. There is no upper limit on his capacity of running at high speeds. (a) Find the minimum time that he will have to take in completing the 50 m starting from rest. (b) Suppose he takes exactly this minimum time to complete the 50 m, what minimum time will he take to stop? To reach the 50 m distance in minimum time, the superman has to move with maximum possible acceleration. Suppose the maximum acceleration required is ‘a‘. u = 0, t = ? 1/23. Show that no matter how hard the driver applies the brakes, the car will reach the bottom with a speed greater than 36 km/hr. Take g = 10 m/s2. When the driver applies hard brakes, it signifies that maximum force of friction is developed between the tyres of the car and the road. ν=u2+2as =62+22.5 12.8 =36+64 =10 m/s=36 km/hTherefore, the harder the driver applies the brakes, the lower will be the velocity of the car when it reaches the ground, i.e. at 36 km/h. A car starts from rest on a half kilometre long bridge. The coefficient of friction between the tyre and the road is 1.0. Show that one cannot drive through the bridge in less than 10 s.
Let a be the maximum acceleration of the car for crossing the bridge. To cross the bridge in minimum possible time, the car must be at its maximum acceleration. 500=0+1210t2⇒t=100=10 sTherefore, if the car’s acceleration is less than 10 m/s2, it will take more than 10 s to cross the bridge. So, one cannot drive through the bridge in less than 10 s.
Figure (6−E6) shows two blocks in contact sliding down an inclined surface of inclination 30°. The friction coefficient between the block of mass 2.0 kg and the incline is μ1, and that between the block of mass 4.0 kg and incline is μ2. Calculate the acceleration of the 2.0 kg block if (a) μ1 = 0.20 and μ2 = 0.30, (b) μ1 = 0.30 and μ2 = 0.20. Take g = 10 m/s2. p+2a+23-10=1063+6a+30+23=0⇒6a=30-83 =30-13.85=16.15⇒a=16.156 =2.69=2.7 m/s2(b) In this case, the 4 kg block will move at a higher acceleration because the coefficient of friction is less than that of the 2 kg block. Therefore, the two blocks will move separately. By drawing the free body diagram of 2 kg mass, it can be shown that a = 2.4 m/s2. Two masses M1 and M2 are connected by a light rod and the system is slipping down a rough incline of angle θ with the horizontal. The friction coefficient at both the contacts is μ. Find the acceleration of the system and the force by the rod on one of the blocks. The force exerted by the rod on one of the blocks is tension, T.
A block of mass M is kept on a rough horizontal surface. The coefficient of static friction between the block and the surface is μ. The block is to be pulled by applying a force to it. What minimum force is needed to slide the block? In which direction should this force act? Let P be the force applied to slide the block at an angle θ. ⇒P=μ mgμ sin θ+cos θThe applied force P should be minimum, when μ sin θ + cos θ is maximum. μ mg1+μ2 at an angle θ = tan−1 μ. The friction coefficient between the board and the floor shown in figure (6−E7) is μ. Find the maximum force that the man can exert on the rope so that the board does not slip on the floor. Let T be the maximum force exerted by the man on the rope. A 2 kg block is placed over a 4 kg block and both are placed on a smooth horizontal surface. The coefficient of friction between the block is 0.20. Find the acceleration of the two blocks if a horizontal force of 12 N is applied to (a) the upper block, (b) the lower block. Take g = 10 m/s2. Consider the free body diagram. The 2 kg block has acceleration 4 m/s2 and the 4 kg block has acceleration 1 m/s2. Find the accelerations a1, a2, a3 of the three blocks shown in figure (6−E8) if a horizontal force of 10 N is applied on (a) 2 kg block, (b) 3 kg block, (c) 7 kg block. Take g = 10 m/s2. (a) When the 10 N force is applied to the 2 kg block, it experiences maximum frictional force. a1=62=3 m/s2But for the 3 kg block (Fig. 3), the frictional force from the 2 kg block, i.e, 4 N, becomes the driving force and the maximum frictional force between the 3 kg and 7 kg blocks. Therefore, the 3 kg block cannot move relative to the 7 kg block. The 3 kg block and the 7 kg block have the same acceleration (a2 = a3), which is due to the 4 N force because there is no friction from the floor. ∴a2=a3=410=0.4 m/s2(b) When the 10 N force is applied to the 3 kg block, it experiences maximum frictional force of (15 + 4) N, i.e., 19 N, from the 2 kg block and the 7 kg block. So, it cannot move with respect to them. As the floor is frictionless, all the three bodies move together. ∴a1=a2=a3=1012=56 m/s2(c) Similarly, it can be proved that when the 10 N force is applied to the 7 kg block, all three blocks move together with the same acceleration. The friction coefficient between the two blocks shown in figure (6−E9) is μ but the floor is smooth. (a) What maximum horizontal force F can be applied without disturbing the equilibrium of the system? (b) Suppose the horizontal force applied is double of that found in part (a). Find the accelerations of the two masses. ⇒a=2 μmgM+m in opposite directions. Suppose the entire system of the previous questions is kept inside an elevator which is coming down with an acceleration a < g. Repeat parts (a) and (b). (b) Let the acceleration of the blocks be a1. ⇒a1=2μm g-aM+mThus, both the blocks move with same acceleration a1 but in opposite directions. Consider the situation shown in figure (6−E9). Suppose a small electric field E exists in the space in the vertically charge Q on its top surface. The friction coefficient between the two blocks is μ but the floor is smooth. What maximum horizontal force F can be applied without disturbing the equilibrium? 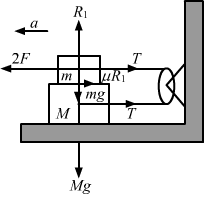 Therefore, the maximum horizontal force that can be applied is 2μ (mg − QE). A block of mass m slips on a rough horizontal table under the action of a horizontal force applied to it. The coefficient of friction between the block and the table is μ. The table does not move on the floor. Find the total frictional force applied by the floor on the legs of the table. Do you need the friction coefficient between the table and the floor or the mass of the table? 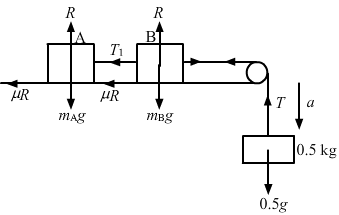 When a block slips on a rough horizontal table, the maximum frictional force acting on it can be found from the free body diagram (see below). Therefore, the total frictional force on the table by the floor is μmg. Find the acceleration of the block of mass M in the situation of figure (6−E10). The coefficient of friction between the two blocks is μ1 and that between the bigger block and the ground is μ2. Let us the acceleration of the block of mass M be a and let it be towards right. Therefore, the block of mass m must go down with acceleration 2a. As both the blocks are in contact, it (block of mass m) will also have acceleration a towards right. Hence, it will experience two inertial forces as shown in the free body diagram given below. A block of mass 2 kg is pushed against a rough vertical wall with a force of 40 N, coefficient of static friction being 0.5. Another horizontal force of 15 N, is applied on the block in a direction parallel to the wall. Will the block move? If yes, in which direction? If no, find the frictional force exerted by the wall on the block. ∴tan θ=2015=43⇒θ=tan-143=53°Therefore, the block will move at 53° angle with the 15 N force. 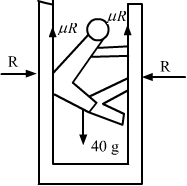 A person (40 kg) is managing to be at rest between two vertical walls by pressing one wall A by his hands and feet and the other wall B by his back (figure 6−E11). Assume that the friction coefficient between his body and the walls is 0.8 and that limiting friction acts at all the contacts. 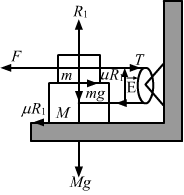 (a) Show that the person pushes the two wall with equal force. (b) Find the normal force exerted by either wall on the person. Take g = 10 m/s2. Figure (6−E12) shows a small block of mass m kept at the left end of a larger block of mass M and length l. The system can slide on a horizontal road. The system is started towards right with an initial velocity v. The friction coefficient between the road and the bigger block is μ and that between the block is μ/2. Find the time elapsed before the smaller blocks separates from the bigger block. Let a1 and a2 be the accelerations of masses m and M, respectively. Also, a1 > a2 so that mass m moves on mass M.
Let after time t, mass m is separated from mass M.